Having first originated in France in the early 1900’s, Aerial Adventure Parks are quickly catching with to the American public. Stemming from the original Ropes Course or Challenge Course, an Adventure Park is best described as an obstacle course set in between trees or poles. Typically, they are open to the public and geared towards a high through put of customers. All sites are different – of course – but many are generally laid out with different levels of courses or paths with unique levels of ability, difficulty and height and many are meant to be client-independent. As there are a variety of safety systems used, the industry is slowly moving towards Smart Belay Systems containing carabiners and lanyards (attaching the participant to the belay cable) that will lock and unlock when appropriate. Just like Zip Tours and Challenge Courses, it is incredibly important that you choose a trusted and qualified professional to take care of your project. Synergo has been a member of the Association for Challenge Course Technology (ACCT) for a number of years and became an accredited Professional Vendor Member (PVM) in 2002. As a PVM our work is periodically reviewed to assess compliance with the construction standards set forth by ACCT – which means we are a full-service provider for Aerial Adventure Parks. As such, we offer design, installation of your elemtents and platforms, braking system installation, fall protection access, rescue equipment, creation of a policy and procedure manual specific to your site, staff training and testing. 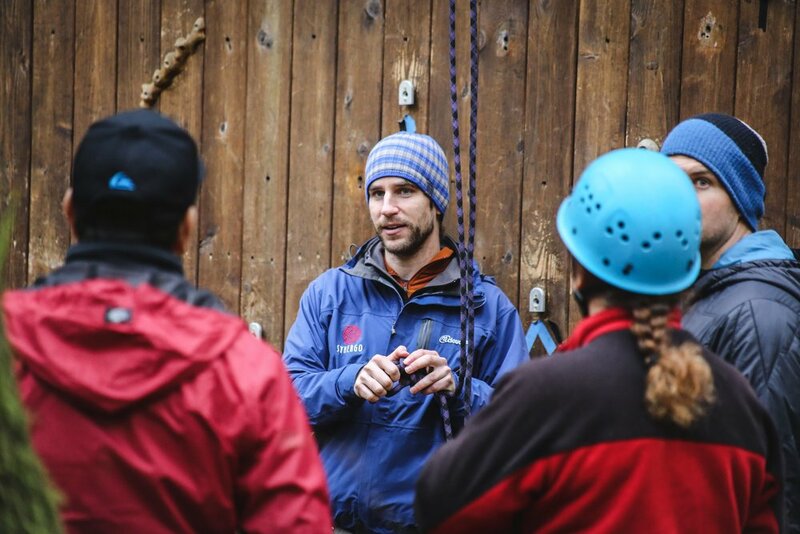 Our trainings provide Aerial Guides with the technical and interpersonal skills needed to effectively guide and supervise participants through the park as well as facilitate customer flow, prevent back ups and be ready for rescues at a moment’s notice. As a Professional Vendor Member (PVM), Synergo is qualified to provide a variety of additional services on top of the design and construction of an Adventure Park. Typically, large scale projects will include aspects seen below. Curious about exploring these options? Please let us know if you'd prefer we email you to be in touch.